What brought you to Pattiland Farm & what was it like when you came here? At age 18 I my first car was a Series 3 Land Rover. Although it wasn't unreliable, it did need some routine work, but I didn't know the first thing about vehicles. Thanks to my friend Bob Belchamber, I managed to learn a few basic things and with his help started to undertake my own maintenance. 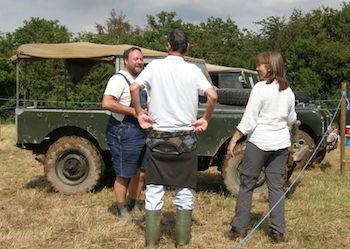 It was then that I read an article in the Land Rover Owner magazine about rebuilding a series 3 Landy ... I read it and thought I would like to have a go... I rebuilt a series 3 LWB Land Rover in about 6 weeks. I sold my original Series 3 to buy a 90, which I then sold to buy a 101 Forward-Control. At this point I stopped selling them, but 2 series one's, 2's, 3's, 101FC and a 110 later, I was needing more space - so a move to somewhere like a small farm became necessary. Pattiland Farm was Derelict - no power, no sanitation, just a water hose and a cottage and buildings that were falling down. We decided that before anything was disturbed, it would be a good idea to research the history of the property, to ensure we didn't destroy any original features in the resurrection of the farm. Sylvia undertook the research, which turned out to be a rather difficult and long job. The farm consists of Pattiland and Moistown - which is a registered monument. Records kept turning up for Moistown, but very little for Pattiland. As the research continued, it became apparent that Moistown is a historically interesting and important site. We needed to find out more and to preserve the site, so we approached the local ACE Archaeology Club, who are now undertaking a very detailed survey of the site and in the last 12 months, have begun excavating the site to see what is left. This has been very interesting and you can find out more by visiting us and ACE Archaeology Club during the festival in July. 12 years on, we are still renovating! Why or how did the Festival come about? Our involvement with ACE Archaeology Club is where it all started. Back in 2009, when ACE first got involved with Moistown, they approached us with a view to opening the site to the public, enabling ACE to take part in the National Festival of Archaeology, organised by the Council for British Archaeology. We agreed and over a 2 day period a small number of people visited the site to see what it was all about. It was over a BBQ on the evening of the first open day, that we discussed ways in which the open days could be made appealing to a wider audience. I had been topping the fields only a few days before, thinking to myself that it would be fun to have a few tractors and Land Rovers on display, with a beer tent - of course. After floating the idea with the members of ACE, we decided to give it a go and during July of 2010, the first Old Technology & Archaeology festival was held. We had over 10 times the interest of the previous year and interest has continued to grow since. What are the aims of the Festival ? The first aim is to provide a way for anyone who is interested in archaeology to get involved with their local clubs or societies, to see what they are doing and to learn more about archaeology in general. If you were ever a fan of "Time Team" on the telly, you will probably enjoy this - but there is a lot more to it than one may first imagine. The aim of our particular contribution to the national festival, is to show not only ancient archaeology, but the more recent things too. Historically, things changed very slowly - methods and technology remained the same for 100's of years. Then as technology starts to develop the pace of change increases, up to the industrial revolution, when steam changed the world forever. The 1940's brought the next major technological revolution - the computer age. This alone has had a tremendous impact on the pace at which technology develops. The Internet is largely responsible for getting new ideas broadcast to the world and these ideas are in turn developed by the collaborative nature of the technology. Instead of doing something the same way for 100's of years, we are getting to the point where technology is changing the way we do things every year! Its a fascinating story - some of which can be re-lived at this event. A lot of what has been learned in the past and was common knowledge to people of the past, has been forgotten in relatively recent times. The activities undertaken both during the festival and throughout the year by groups such as ACE and KERNOW LEVY, are an opportunity to re-learn some of these things. The old phrase "its all been done before" is often quite true. We (the human race) are re-discovering old ways of doing things which rival or even exceed modern expectations. We also try to preserve the knowledge of people alive today, many of whom are of the older generations. Even the methods they used during their working lives are already being forgotten, all in less than 50 years. It is very important to try and preserve some of these relatively recent skills while there are people still alive to pass on the knowledge. How has the Festival changed since the 1st one, what have you learnt over the last 4/5 years? In the first year, we had Moistown - an overgrown jungle of brambles which we were clearing and surveying at the time. It was all very hands-on and not all that much to see. Entry to the open day was free and many people helped with the clearance and the surveying, including members of the public, for which we are very grateful. It has been a huge undertaking to do it sensitively - which largely required the use of hand tools and people power. Machines would have destroyed much of what we are trying to preserve. Understandably, this format did not attract a lot of interest, so we learned that we needed a wider range of exhibits and things for people to do. 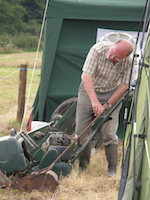 In 2010 we added the 'Old Technology' theme to the open days, which has been successful. More recently we have added living history, which makes for some very interesting exhibits and often exciting displays, which include battle re-enactments. Over the years, we have broadened the subjects to take in a diverse range of exhibits, from the ancient to relatively modern. As well as a dig currently under-way at Moistown, ACE Archaeology club have undertaken many experiments in order to learn more about ancient methods, including cooking in earth ovens, smelting, casting, making boats, building round-houses and much more. ACE put on displays at the festival, which vary from year to year. The representatives on the ACE exhibits are always very happy to talk to visitors about any of the fascinating things the club has been involved with over the past decades. We now have re-enactment groups putting on displays of living history, which basically means they live on site as they would have done at a particular time in history, right down to cooking, wearing the clothes, making tools and much more. Its fascinating to talk with them and learn about what they are doing. I was surprised to find they were even walking around and picking what we now consider to be weeds and eating them! I tried their food and it was really pretty good. Since about 2010, we have had a regular display of historic televisions. These include a 30-line mechanical television system developed by John Logie Baird, during the late 1920's. This is an amazing thing to see working - spinning discs and a tiny flickering picture, bring the very first television to life - and you can see it here. Mike, from the South West TV Museum, also displays a selection of 405 line TVs (the first all-electronic system used in the UK). Starting 2014, we are hoping to have a selection of experimental colour sets (from the 1950's) - which were the original sets used to develop the colour system, which was introduced in the UK during the 1960's. These experimental TVs are quite unlike anything most people will have ever seen and this is a rare opportunity to see this unique exhibit. New for 2013, we put on a display electric equipment, which included domestic appliances and computers. Non-Electic items included gramophones, phonograph, and steam engines. Computers may seem a funny thing to display, as they may not seem all that old - especially some of the newer exhibits from the 1980's - but when you stop and think about it, thats 30 years ago. Classic cars become 'classic' at 25 years, so why not computers? Computers have changed far more rapidly than cars too - the computers of the 1940's were huge, filling large rooms, used punched paper tape and thermionic valves, which created a lot of heat and used a massive amount of electricity, but by the 1960's they were getting smaller thanks to the transistor, and by the 1970's micro computers started to appear, thanks to the Moon landings, which helped to kick-start the emerging micro-chip revolution. The micro computer is responsible for the recent and very sudden changes in technology and indeed the machines of the 70's and 80's are a far cry from anything we have today. Anyone who was working with computers during the 1980's can experience the nostalgia of the preserved hardware on display at the festival. We also have older computer technology dating back to the 60's, which show how much it had changed up to the 1980's. Its interesting to experience some of the 60's type technology and see how very different computing was. We're pleased to also feature some modern computer technology in the form of the tiny Raspberry PI computer. Around the size of a credit card, these little machines are intended to bring back the 80's culture of learning how computers work, rather than simply using commercial software like word processors. This link with the way things used to be is an important reason to include this, itself a historically significant development, in the exhibition. As I said earlier, Land Rovers are a big part of the historic chain of events which lead to the festival - and as well as a display of some of my own vehicles, we also have a selection of enthusiasts who bring their own vehicular exhibits, including vintage and classic cars, vintage and classic tractors, Land Rovers, motorcycles and scooters and more. Going a bit smaller, we have a Lawn Mower and Horticultural Machinery exhibit, featuring many machines our visitors will be familiar with from the past. In addition to the exhibits, there are a selection of trade stalls and a car boot sale. Food and drink, including the Duke of York Real-Ale Bar are available on site throughout the show days. We're always looking for something new or a bit different - so please do contact us if you have something to display or a trade stall that could be of interest. You can register for the show on-line here on this web site. What would you like to see in future for the Festival? This show is really about trying to be something very different to the normal vintage rally and as "hands-on" as we can make it. It remains a mix of some of everything, but it is distinctly unique in other ways, in which we are actively developing the show. Its is both eclectic and yet a nicely related set of exhibits and activities, which is difficult to explain. Its something you really need to experience to fully understand what its all about. If you are the kind of person who likes visiting vintage rallies, steam fairs or museums, or like TV programs about archaeology and history, then you will likely find something of interest for you at the festival. If you are the kind of person who likes to take part in the exhibition or you like to take your trade stand to shows that are a bit different, then this is definitely for you. If you would like to exhibit or trade at the show, please register here on the web site. We are offering a discount for anyone registering a trade stall early - details on the registration page. Entry for exhibitors remains FREE at this show. We try to make it fun for the exhibitors as well as the visitors to the show. Whether you fancy a relaxing free weekend in Devon, by becomming an exhibitor, or you like the fun of exhibiting at shows, we welcome all enquiries.